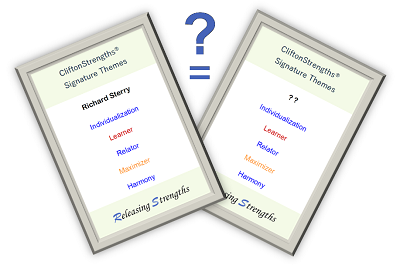 Register your Clifton Strengths themes to see if we can find your Strengths Twin. Strengths Twins are two people with the same Top 5 themes, in any order. Your information supplied here is purely for the Strengths Twins initiative. It is not shared with anyone, except with your Strengths Twin, and it is not used for marketing purposes. When we discover your Strengths Twin, we will contact you and your Strengths Twin. You will both be able to see each other's email addresses. It is up to you how much you converse together, we leave that conversation with you. At the bottom of the form, tick the box to Register. After registration, you will receive a confirmation email to verify your email address. You must verify your email address to have a chance of finding your Strengths Twin. Other than that, we won't contact you until we find your Strengths Twin. If we find another match, we will let you know that you are part of a Strengths Triplet, Quad etc. Very occasionally we send out the Strengths Twin News, tick the box if you wish to receive these updates. You can change your mind at any time by clicking the unsubscribe link in the footer of any email you receive from us, or by contacting us at hello@releasingstrengths.com. We will treat your information with respect. For more information about our privacy practices please visit our website. By clicking below, you agree that we may process your information in accordance with these terms.